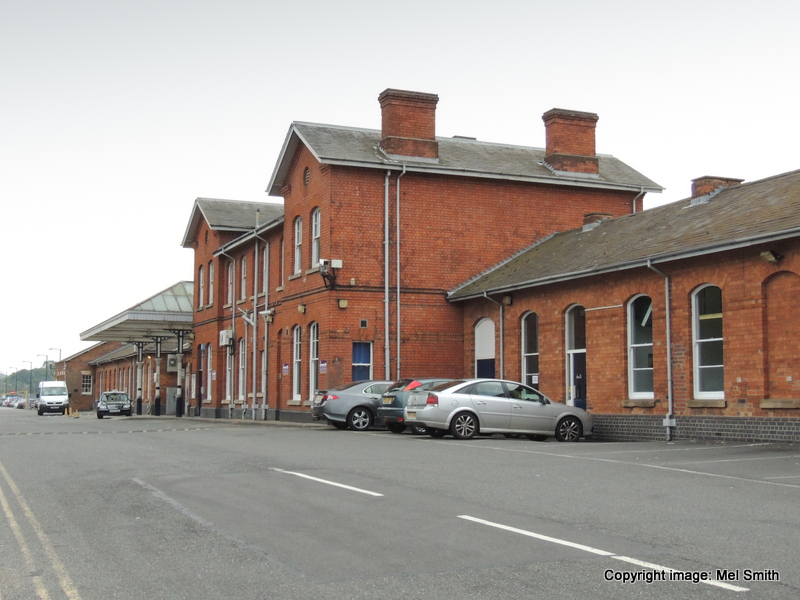 Even after the modernisation period during the mid 1980s, the external elevations of most buildings facing Station Road remain virtually unchanged from how they would have looked to any traveller approaching the station over the last 100 years. Our starting point will be the familiar two storey building and adjacent single storey building to the immediate right of the main entrance. 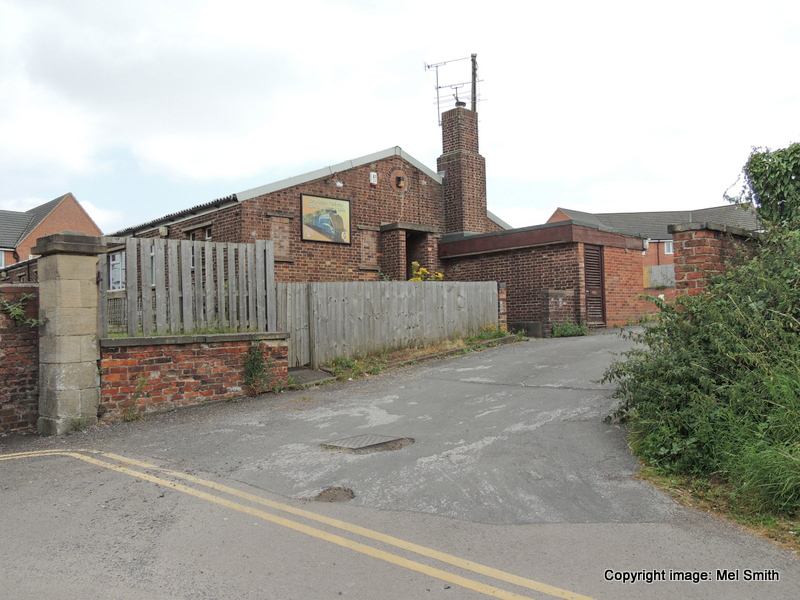 Before moving forward from this location we will first take a minor detour (the loco spotters route) to head back down Station Road and under the railway lines, via the subway on the left, to find the old BRSA Club (Now the Grantham Railway Club). 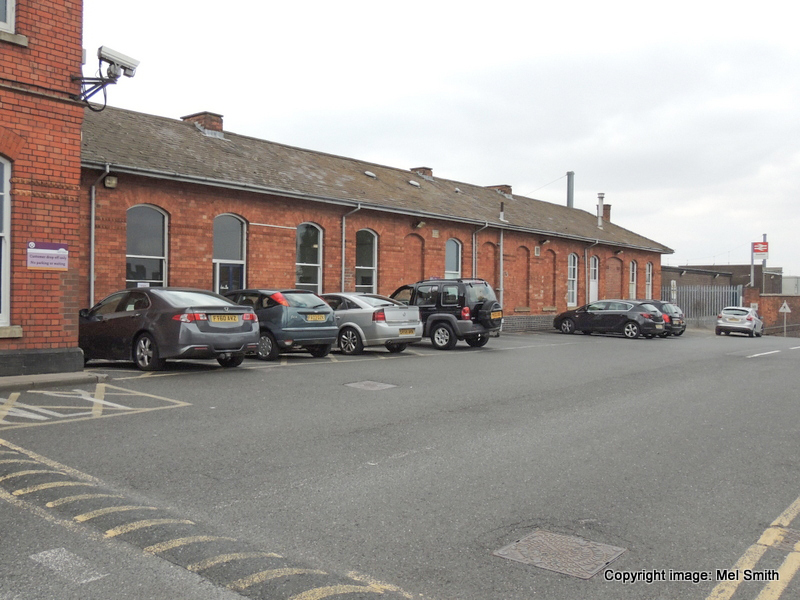 We then return to our starting point outside the main station entrance and travel southwards along Station Road finishing off this section at the site of the former Goods Shed. 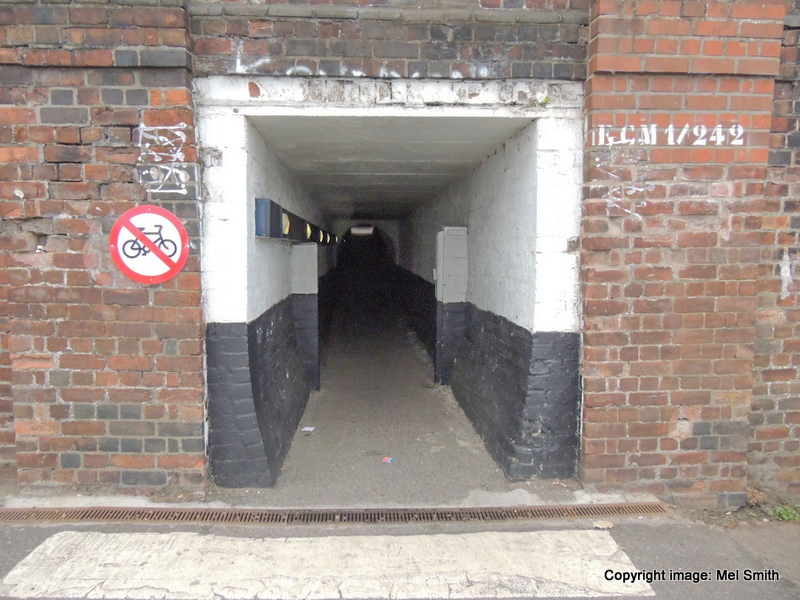 You can compare these images with similar views shown in our late 1970s B&W station survey. Turning to the right we see a row of single storey buildings. 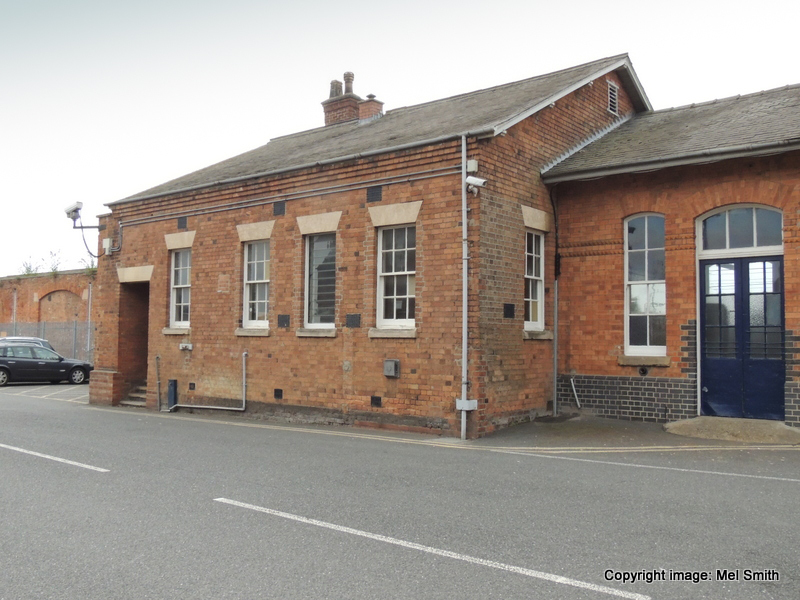 These originally housed from the left, an Inspectors Office, Gents 1st Class Waiting Room, Gents Toilet, Porters Room, Fish House and a General Store. Moving along to the far end of the single storey buildings we can see that the former Fish House entrance doors have been bricked up. To see what the original doors looked like visit our 1970s B&W section. The General Store can be seen to the right. 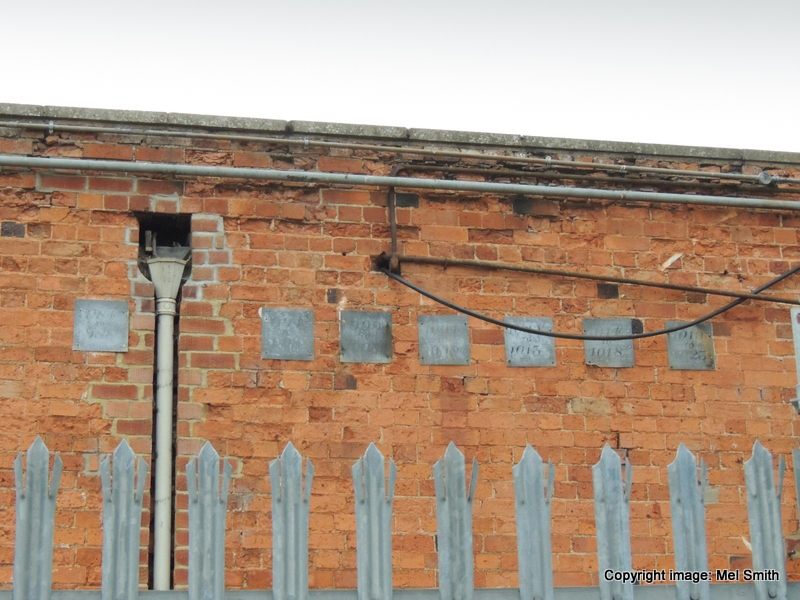 The bricked up entrance of the former Fish House. Temporarily leaving the station behind we head north down Station Road to find the subway entrance in the far distance. 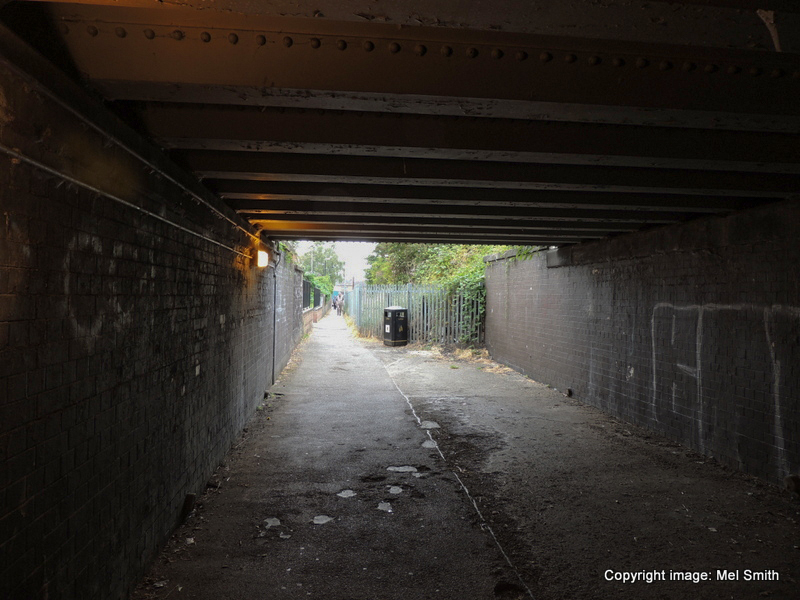 The subway entrance comes into view on our left. Why not, thankfully it's illuminated these days! 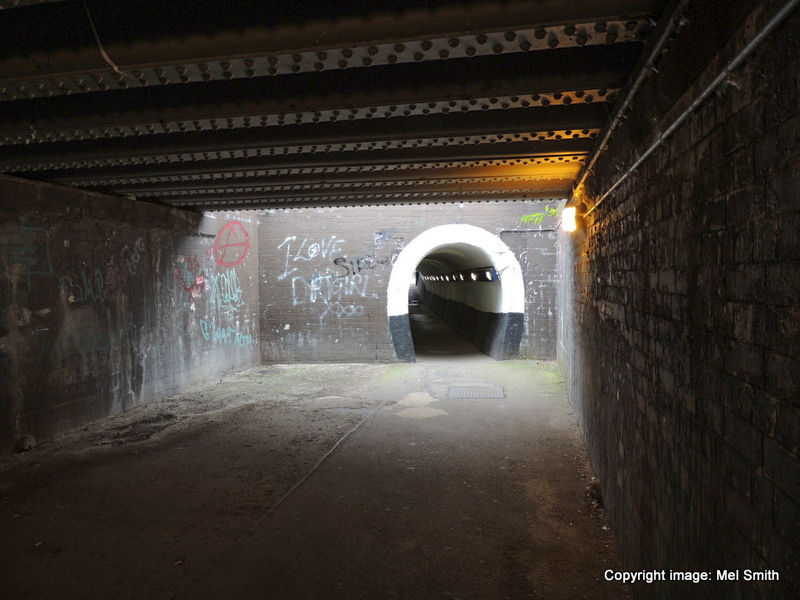 Now safely through the first subway we find ourselves directly under the railway and take a moment to look back east towards Station Road at the far end of the tunnel. Turning around we continue our detour and head on along a narrow path towards daylight. Having arrived at the end of the path we look back east again towards the subway. 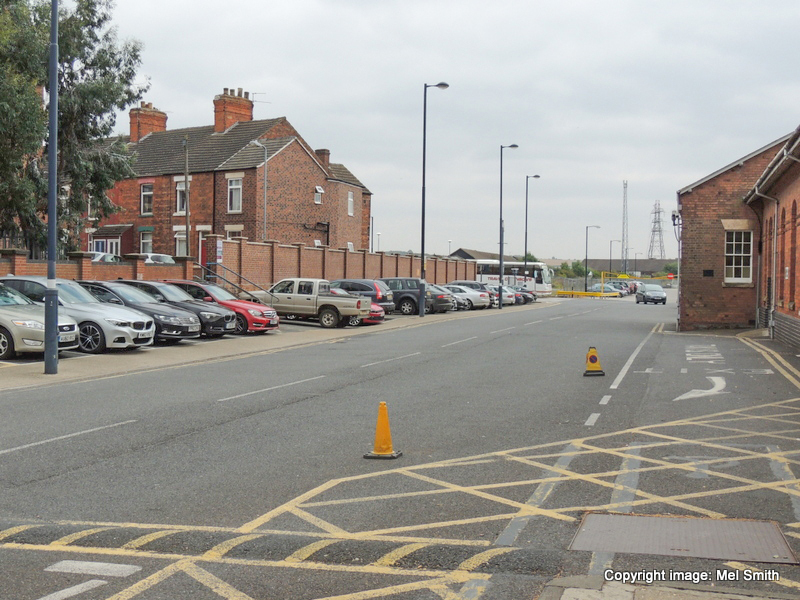 Beyond that but out of view in this image is our starting point on Station Road. 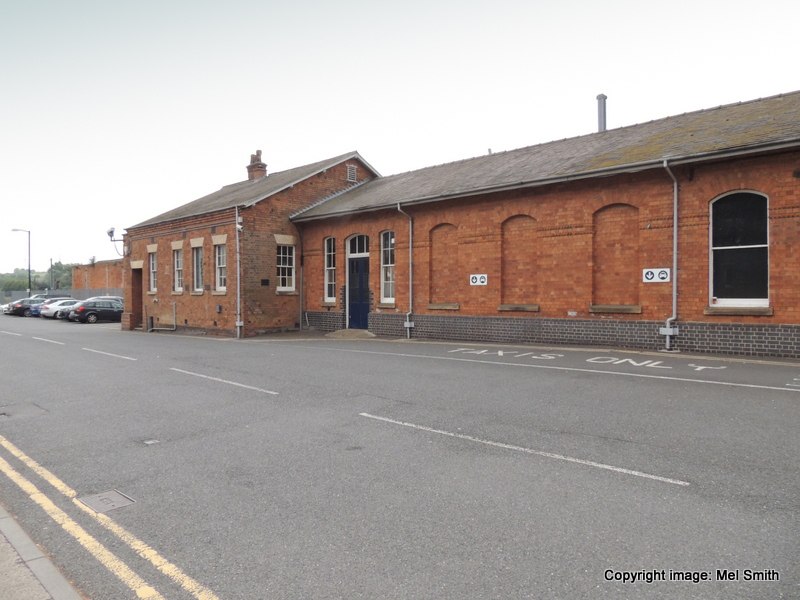 Looking right from the previous photograph the car park entrance for the Grantham Railway Club can be seen. 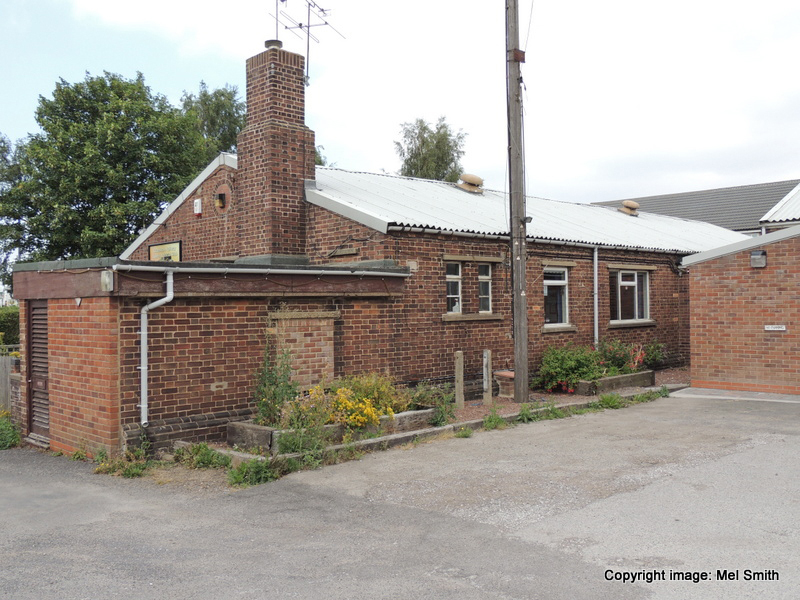 At one time this was the British Railways Staff Association (BRSA) Club. 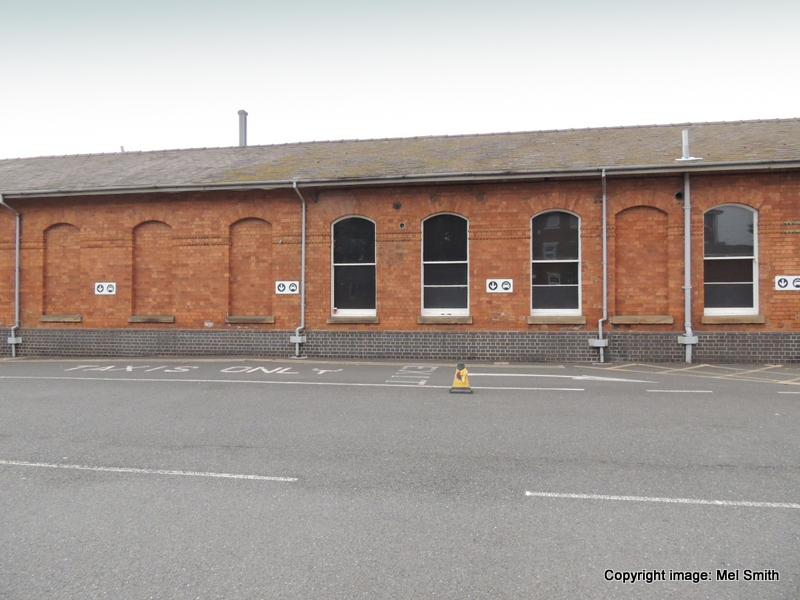 Another view, this time from just inside the car park of the Grantham Railway Club (ex BRSA Club). 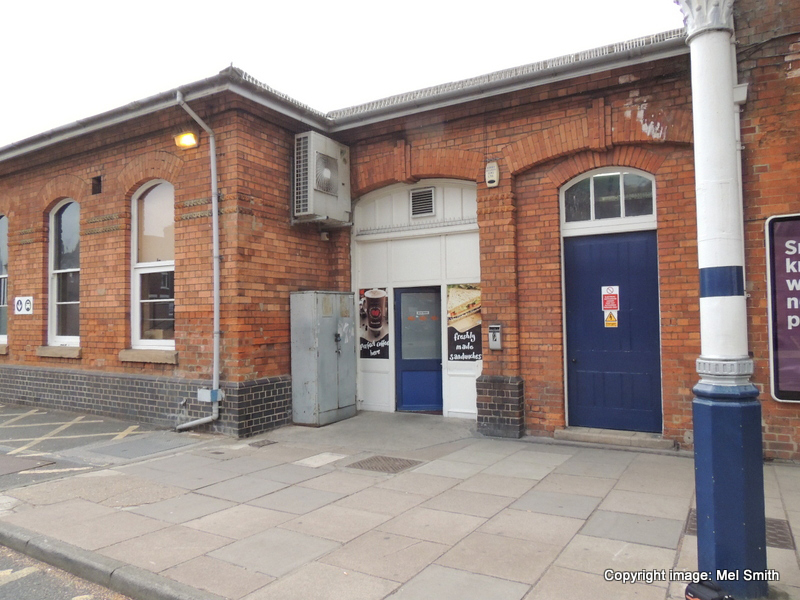 As if by magic we have moved back under the subway to Station Road and find ourselves once again outside the main frontage of the two storey station building, so time to continue on with our tour. 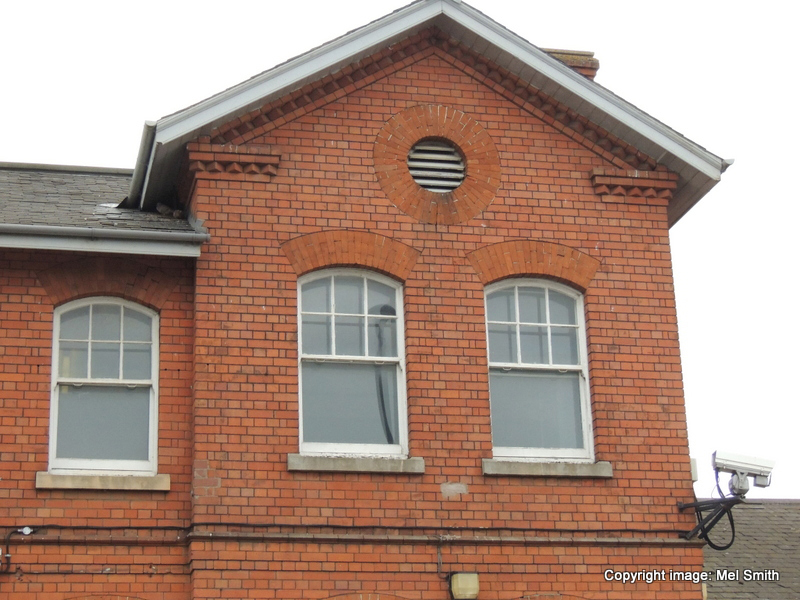 The next few images show brickwork details on the upper floor elevations of the main two storey building. The upper floor central section. The upper floor section adjacent to the main entrance canopy seen on the left. 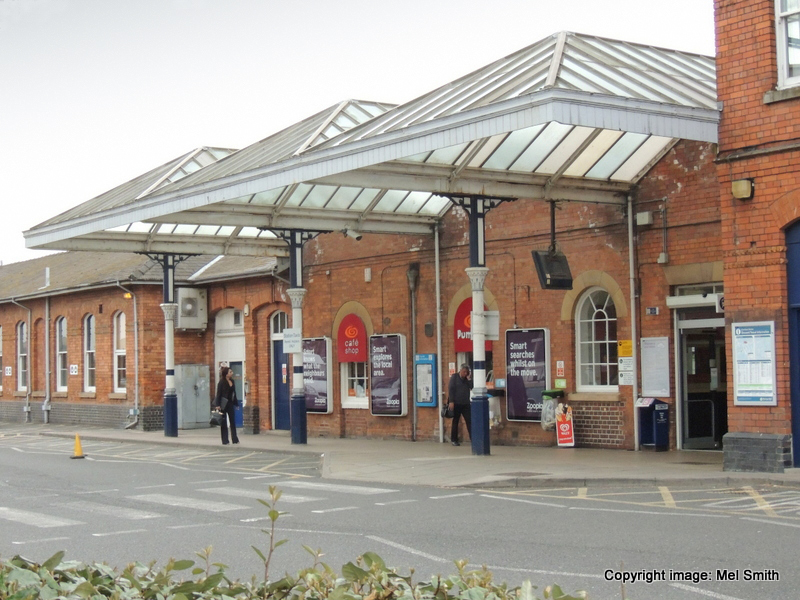 The main entrance doors to the station can be seen on the right; giving access to the ticket office. The large canopy although refurbished in the mid 1980s is almost unchanged. 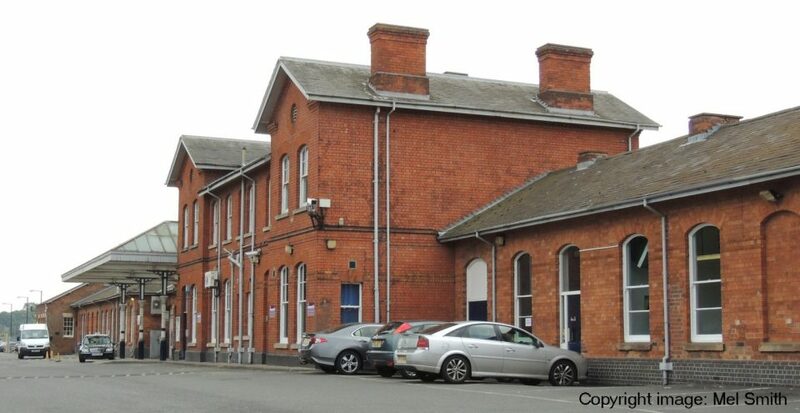 Another view showing the main entrance with Station Road going off to the right. 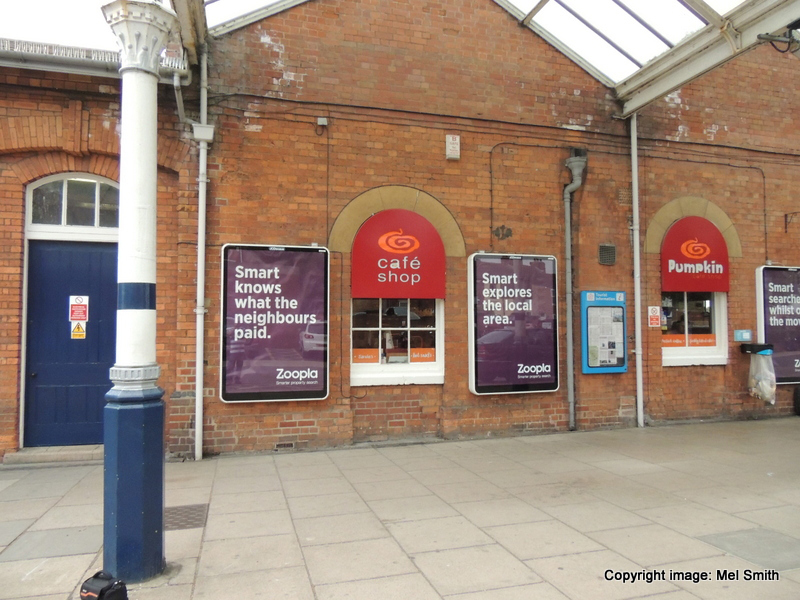 Under the main canopy modern advertising signage adorns the exterior walls complete with ATM cashpoint, far distance. Signs of the times. 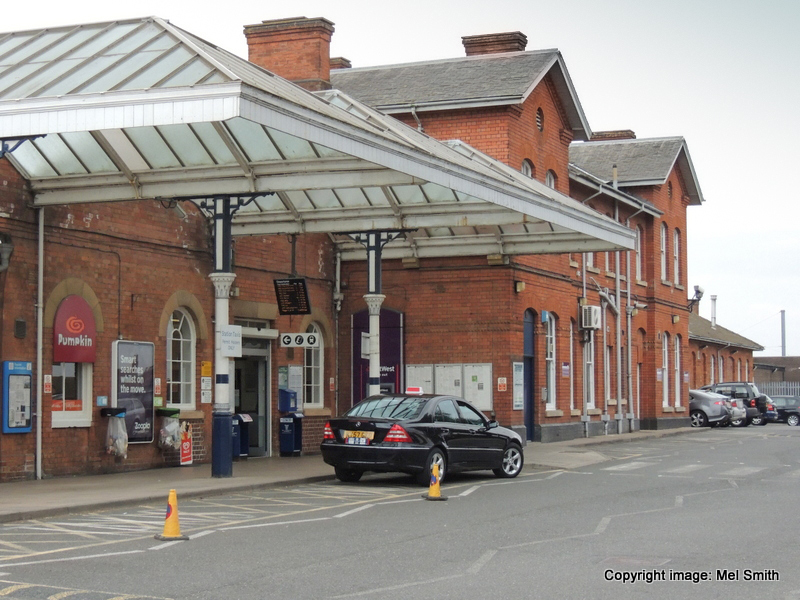 The front elevation of the station entrance area. 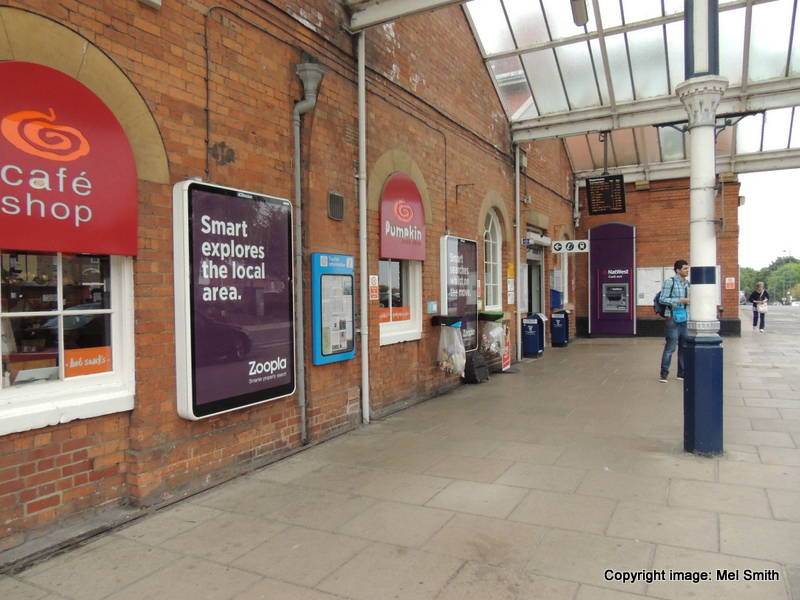 The doorway on the left was formerly associated with the Booking Office. Moving to the left of the previous image. 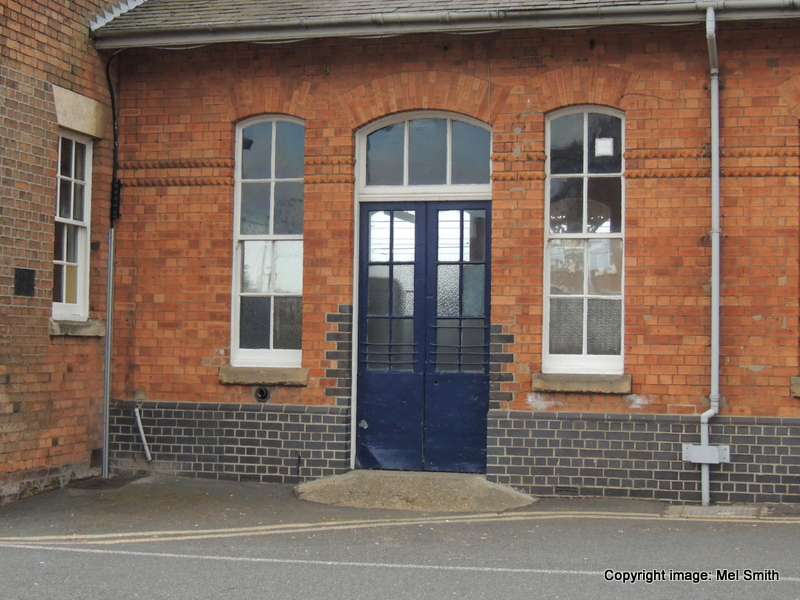 Another view of the doorway (blue) on the right for the former Booking Office. 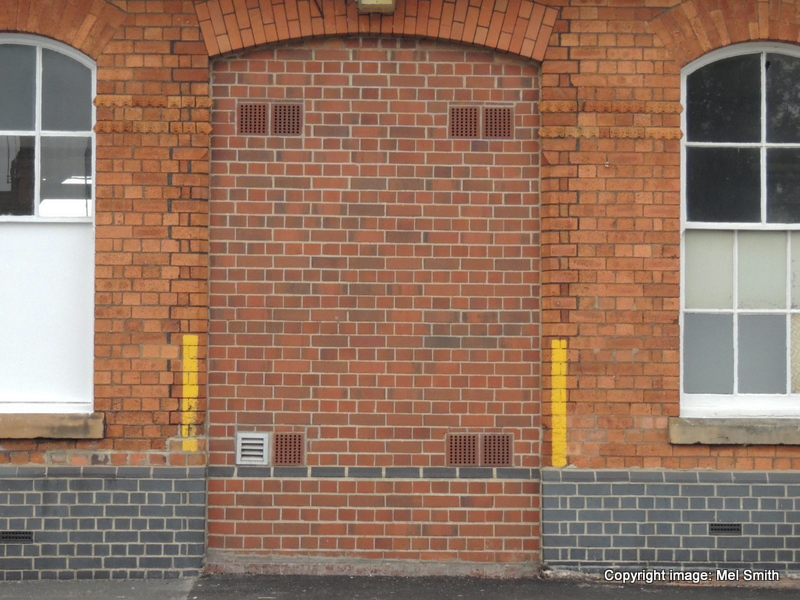 The door on the left was once the Station Masters Office. Moving on from the main entrance area we now come to another single storey block. 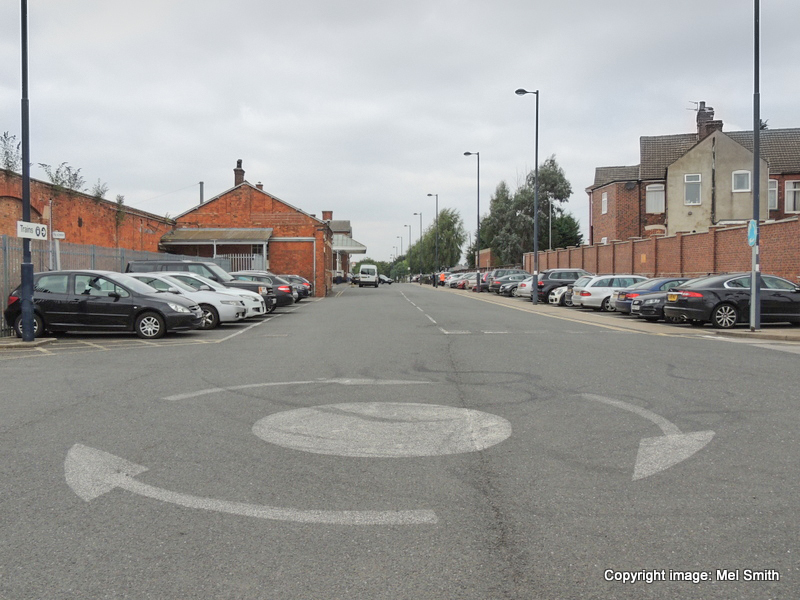 This is a general view looking south along Station Road towards the modern overspill carpark and site of the former Granary and Goods Shed. 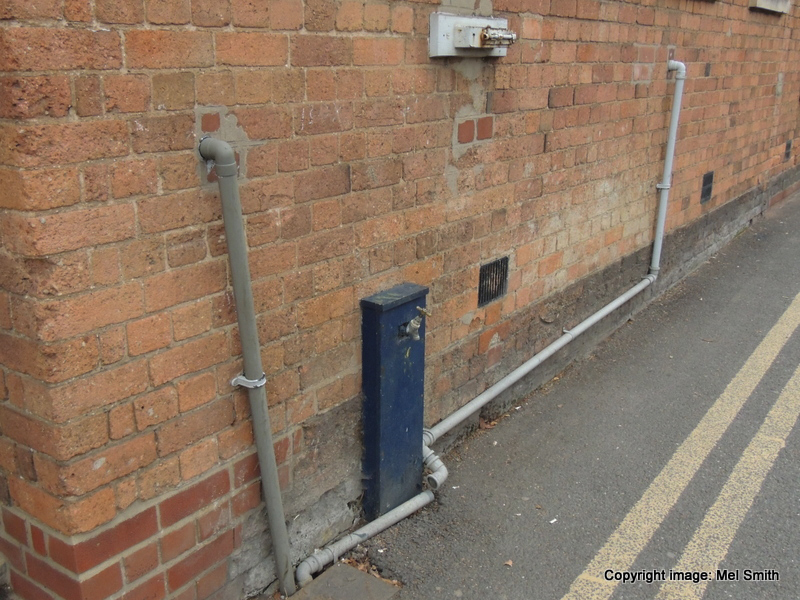 A portion of the single storey block is still visible near the taxi pull in point. Turning to our right we now have a broadside view of the single storey block. 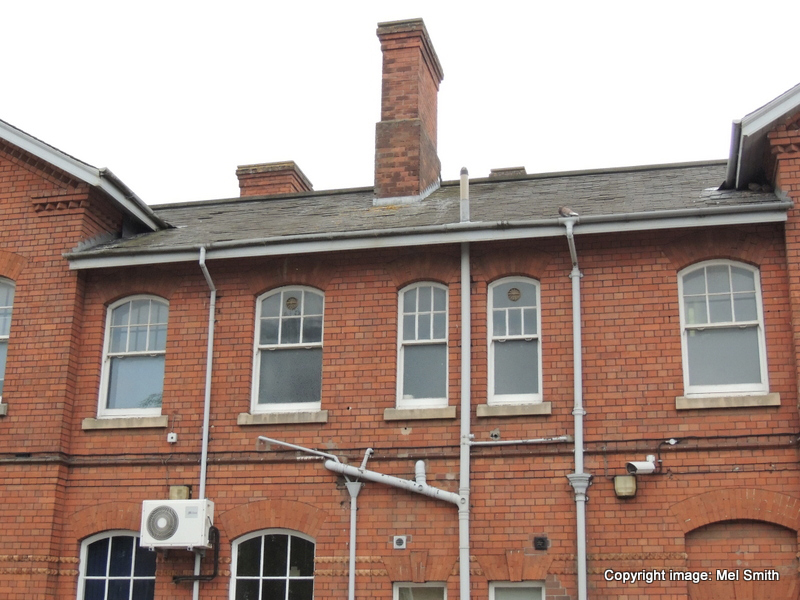 These buildings originally formed Offices on the left and a Ladies 3rd Class Waiting Room on the right. Swinging our camera round slightly to the left, the windows of the former offices are now on the right. 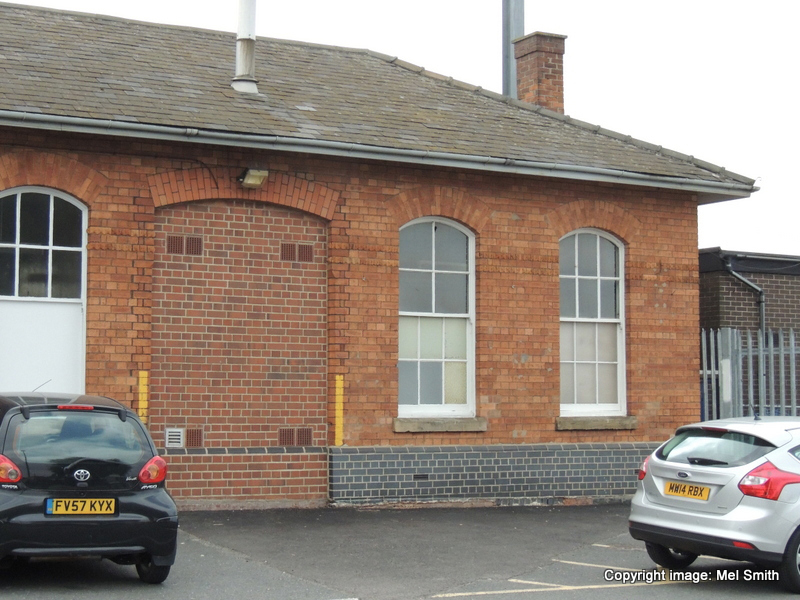 The three section bricked up area was once the back of the Gents toilet on platform 1. 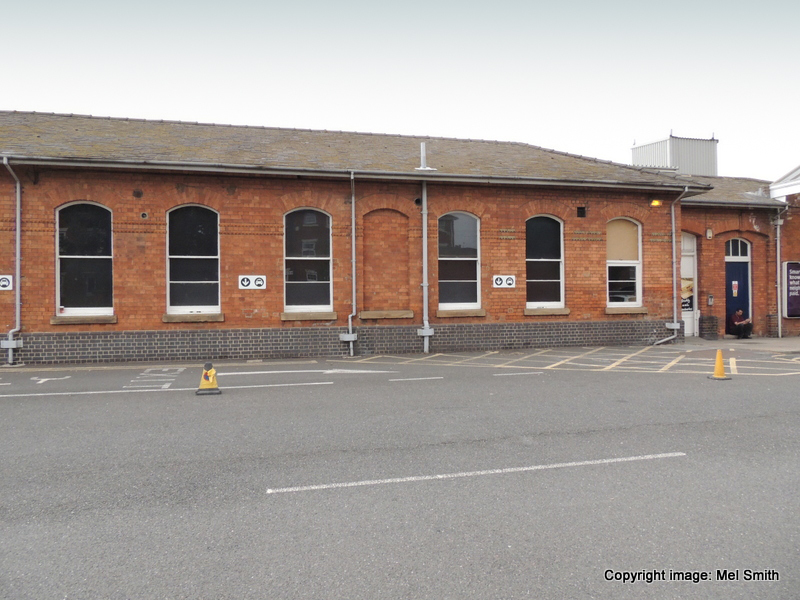 Further to the left and in the centre of this photograph, the doorway to the original Parcels Office can be seen. 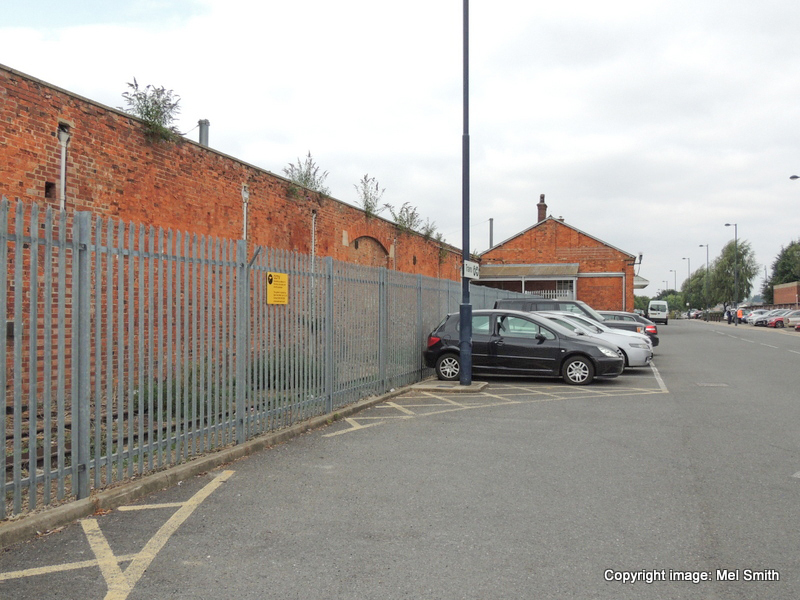 The larger building (left) next to this was the site of the former Goods Agent. 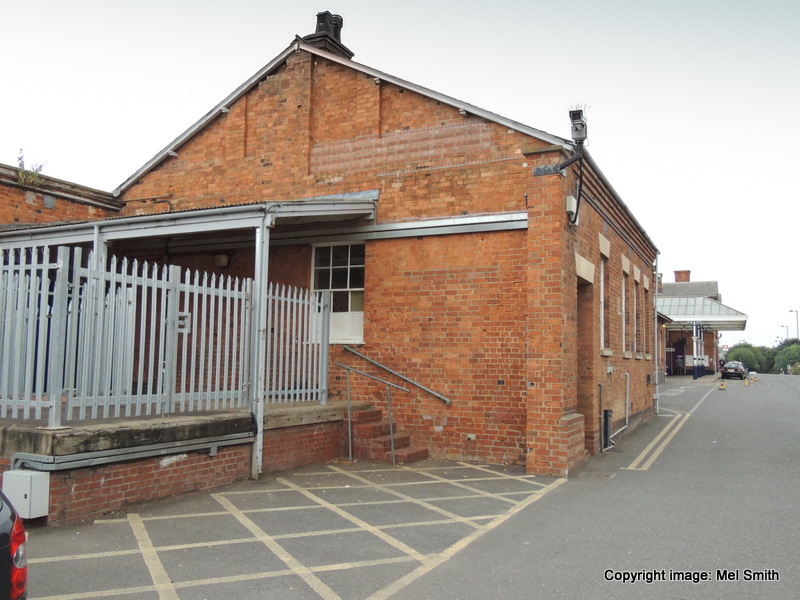 A closer view of the original Goods Agent building looking south west. 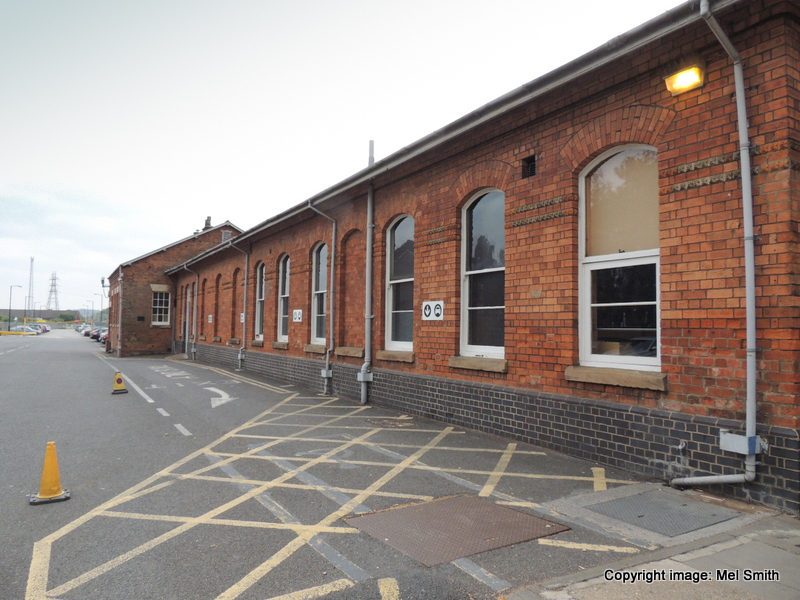 The entrance to the Parcels Office. 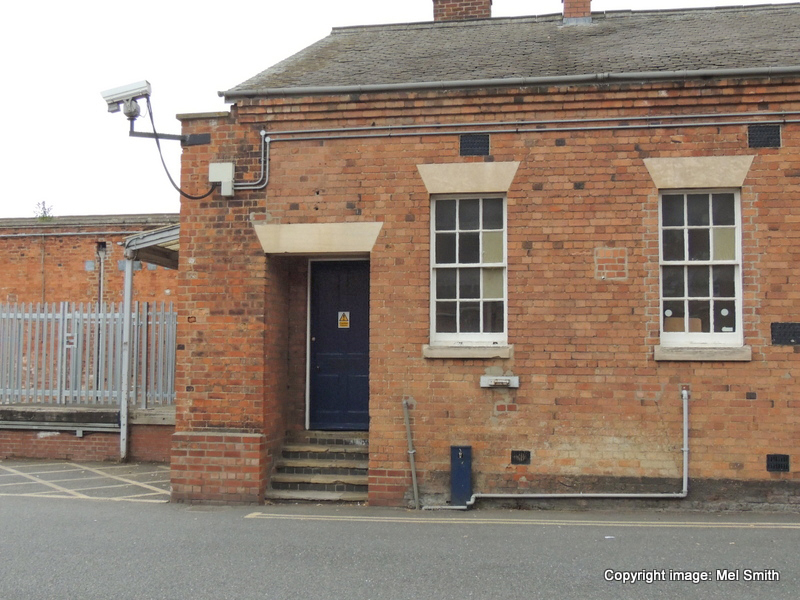 The south end of the Goods Agent's office showing the elevated entrance. 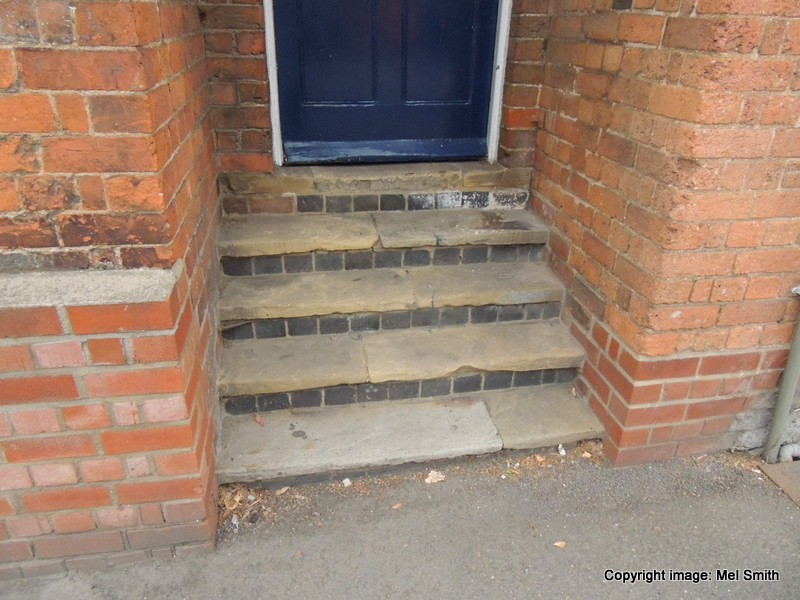 Well worn steps to the Goods Agent's office with some evidence of localised refurbishment in years gone by. Further detail of the area around the Goods Agent entrance. 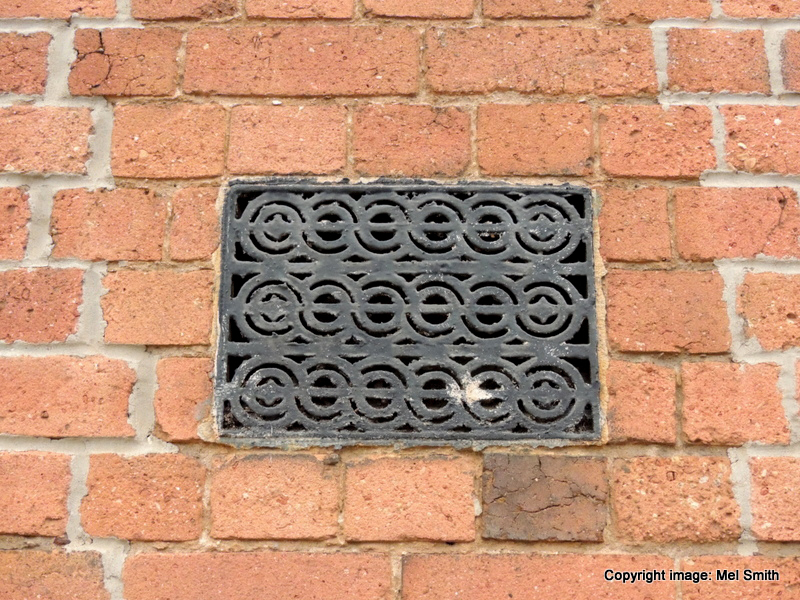 Air vent - former Good Agent building. 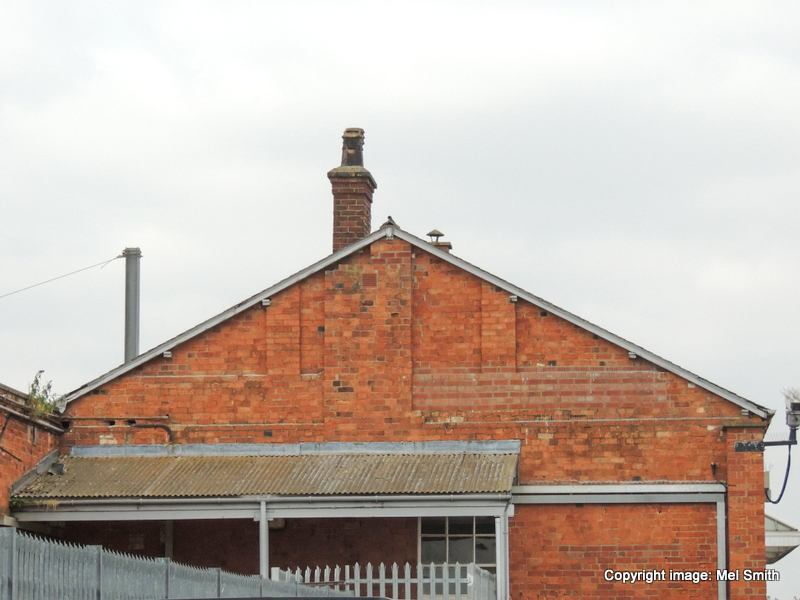 This view shoes the southern gable end of the Goods Agent's offices. 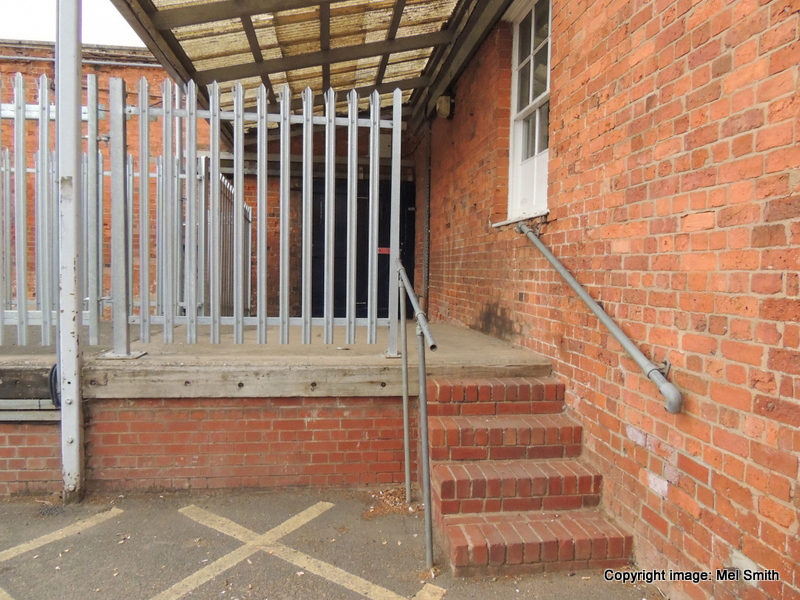 To the left the now fenced off loading dock with access steps from street level. A close up of the steps to the loading dock. 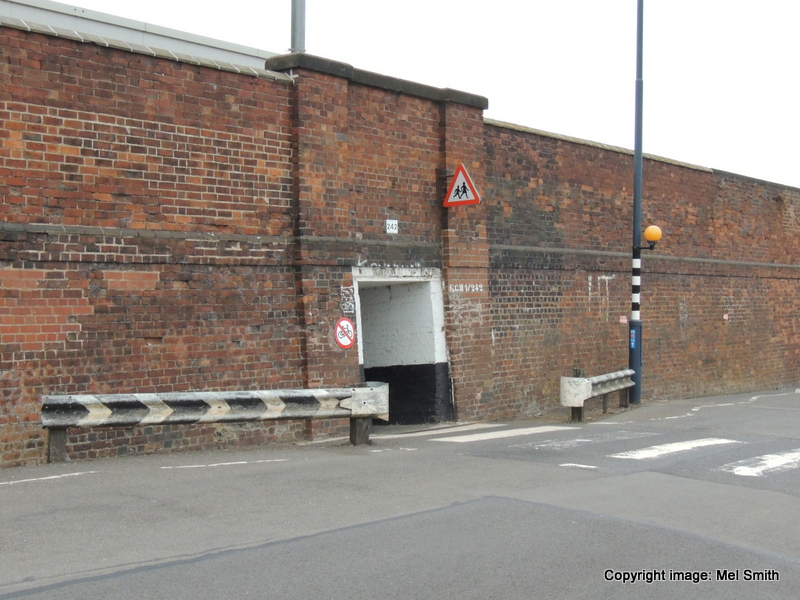 The southern gable end of the Goods Agent building looking north. 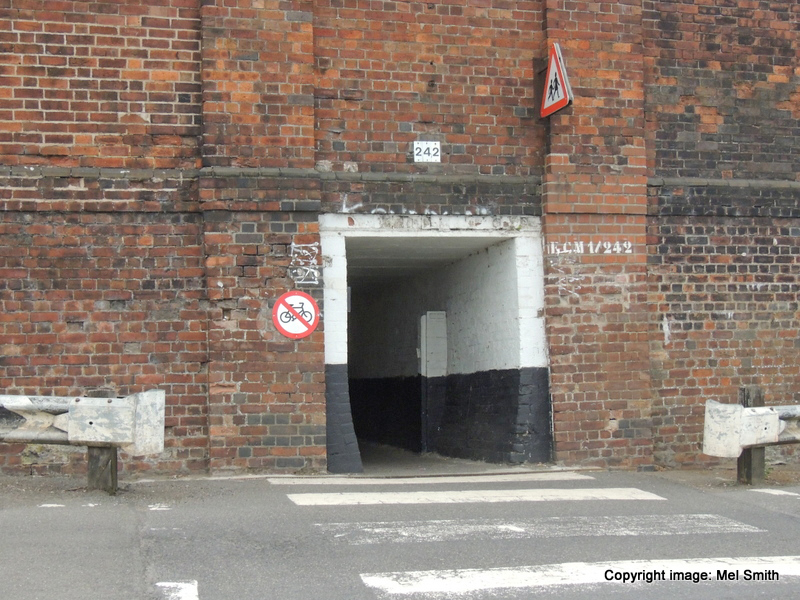 The Goods Shed was situated just about in the area where the photograph was taken, see following images. 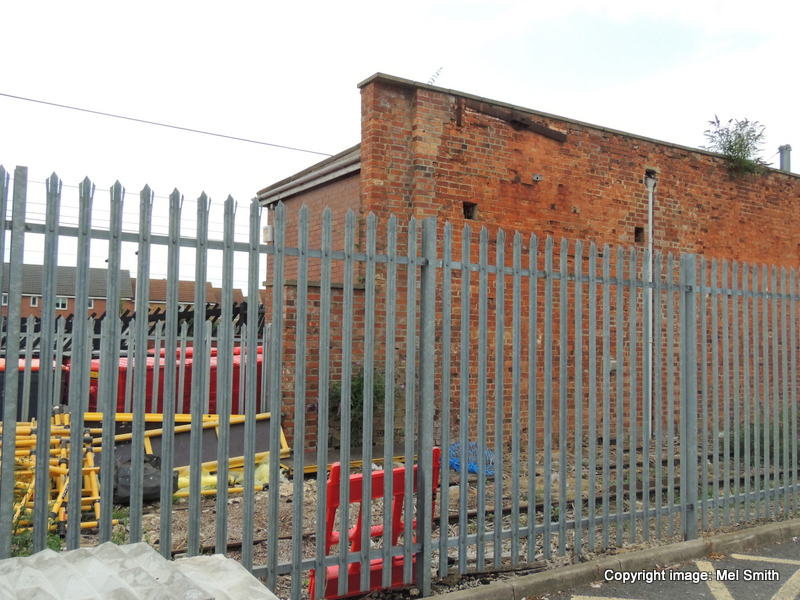 Now forming part of a secure outside storage area the western internal wall of the Goods Shed is in evidence. 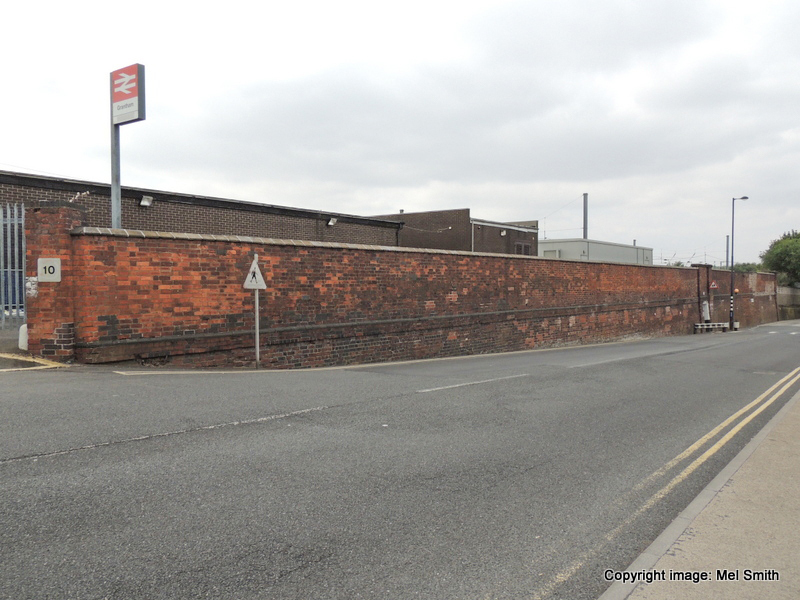 Another view looking north showing on the left the remains of the Goods Shed western wall, with the former Goods Agent offices far centre. 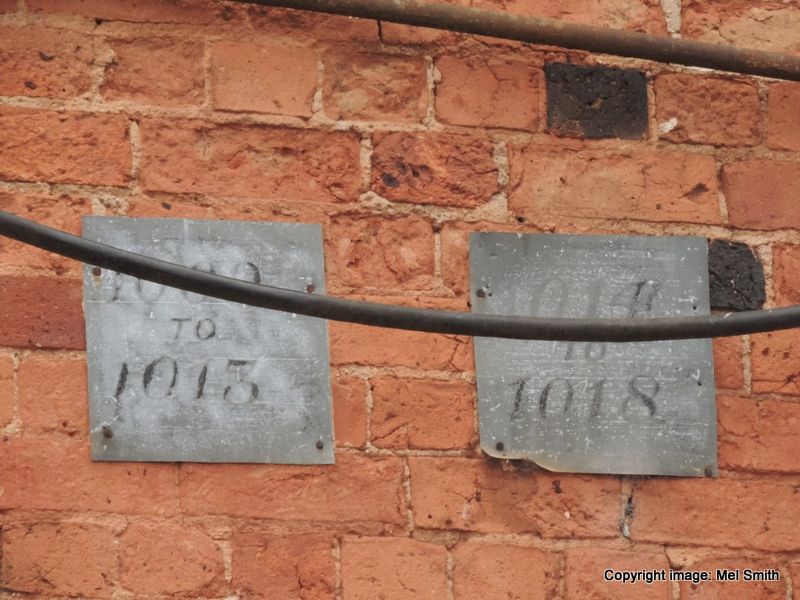 These plates are situated at the top of remaining Goods Shed internal wall and next to the Goods Agent offices. Their origin and use is still the subject of debate, so if you have any knowledge or opinion about what they are please do contact us. A close up of one of the plates. 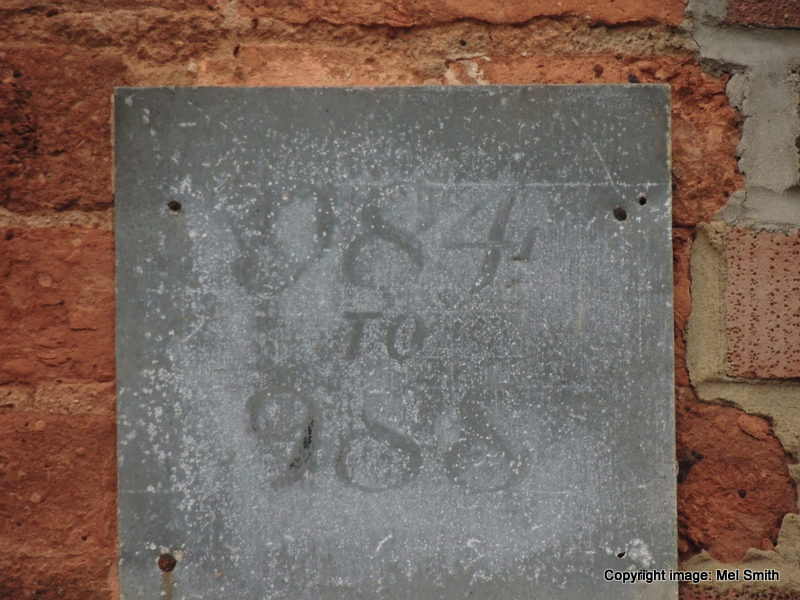 The marking have been somewhat degraded over the years, both by the weather and the paint being removed from the wall behind at some time. Further images of the as yet unidentified plates. Can you help? 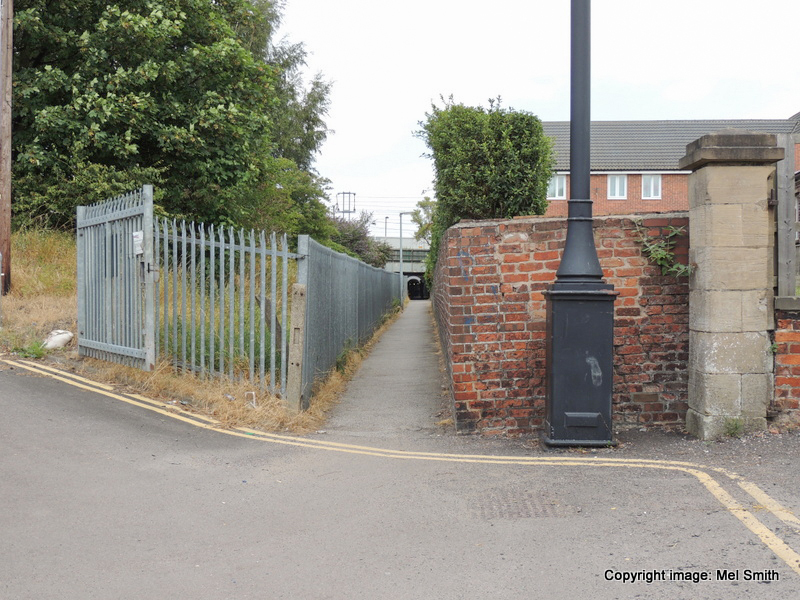 For the final photograph of this section we look back north down Station Road towards the main entrance for the station. The old Water Tank seen in the 1970s B&W section would have been on the right in this view. 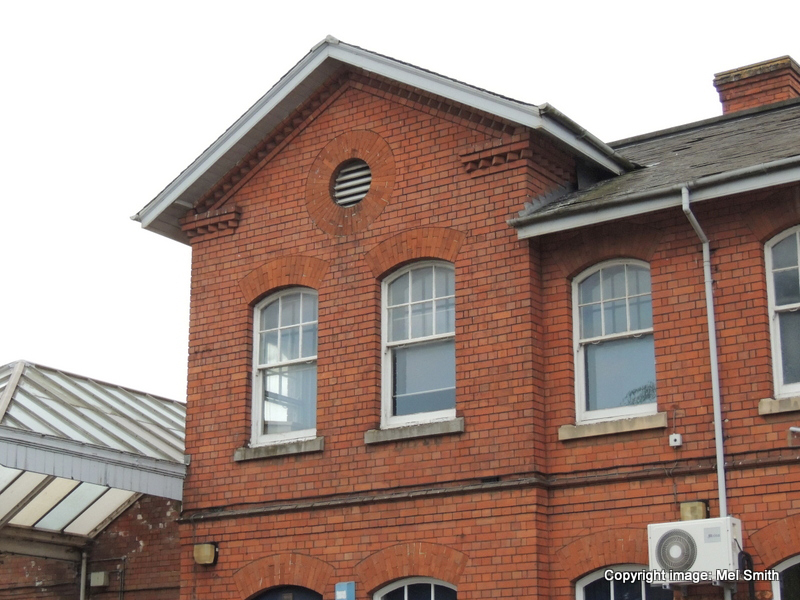 If you have any personal memories, images or additional information relating to the station buildings for potential use in this section, we would love to hear from you. Please note: Unless stated otherwise all images are Copyright: Mel Smith. Copyright note: the article above is published with the appropriate permissions. 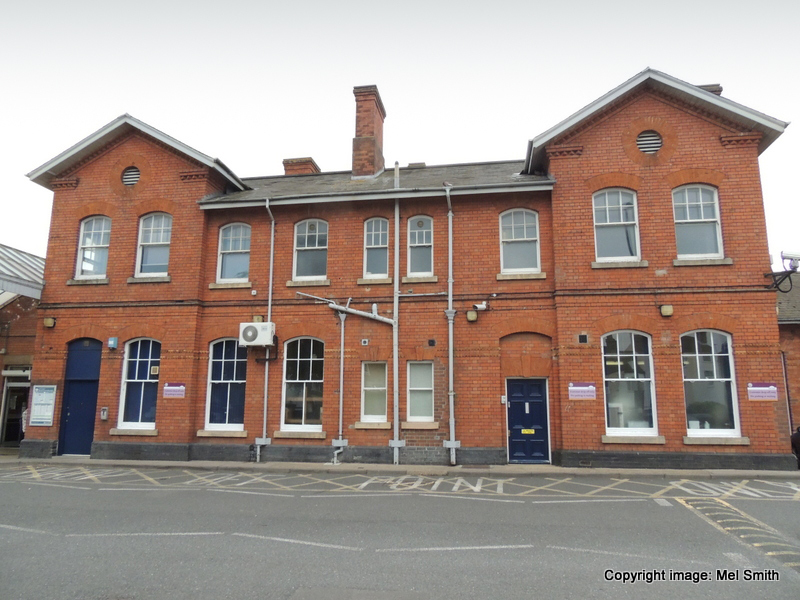 For information about copyright of the content of this website, Tracks through Grantham, please read our Copyright page.